There are two lines in this first episode of Revelations 2 that made me burst out laughing. Both are among the best pieces of dialogue I’ve heard in years, and also the most stupid. It’s uncharacteristically self-aware from a series that is as beloved as it is confusing, and made me feel elated and truly excited to play more. And that sums up episode one on the whole. It’s a healthy length at up to two hours, introduces a suitably daft story, reintroduces old characters, and actually made me jump on more than one occasion. 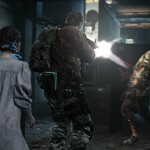 This isn’t Resident Evil of old, though; it’s very modern indeed, with fast-paced gunplay and movement. 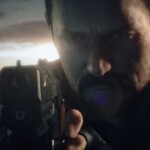 In fact, the moment to moment experience is summed up really easily: it’s a bloody fun shooter. 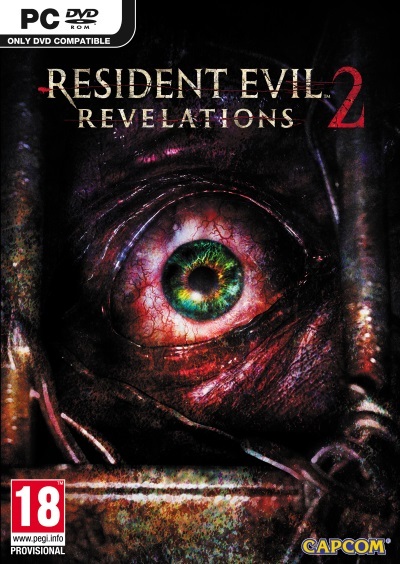 The premise is rather simple for a Resi game, actually. Everything has gone to pot, very suddenly. 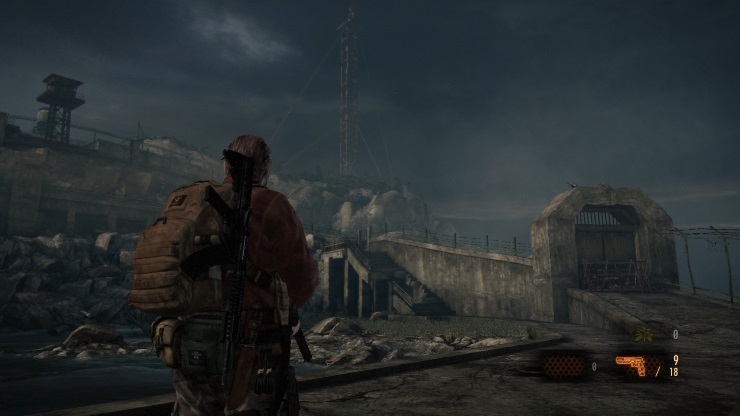 A business-casual evening do has been interrupted by armed assailants, and Claire Redfield and Moira Burton have been kidnapped and ensconced on a weird island, far from civilization, which appears to be full of enemies that, while typical of Resident Evil, also wouldn’t seem amiss in The Last of Us. Seriously, there’s one enemy that looks so much like a clicker it’s uncanny. Eventually a distress call is made, and Barry makes his way to the island. He’s greeted by a strange, almost aparition-like young girl, and they embark on a rescue mission. Right away, the co-op is introduced. Claire’s campaign feels gentler based on this episode, but Moira (you can control both and switch with the Y-button, or play local-only co-op) feels a better, more able partner than Natalia, the little girl who aligns with Barry during his chapters. 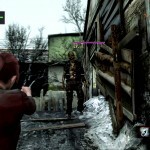 Moira can use a crowbar to open doors and chests, but she also has a torch that can be used, Alan Wake-style, to daze enemies, but also to point out hidden objects. Natalia has a similar method of spotting objects that Barry can’t see, but instead of the crowbar, she can get through small holes and see enemies through walls, helping Barry stealth-kill them. The play styles are well balanced, but the reason it’s offline co-op only becomes abundantly clear right away: playing as the non-combat based character wouldn’t be fun for long stretches. 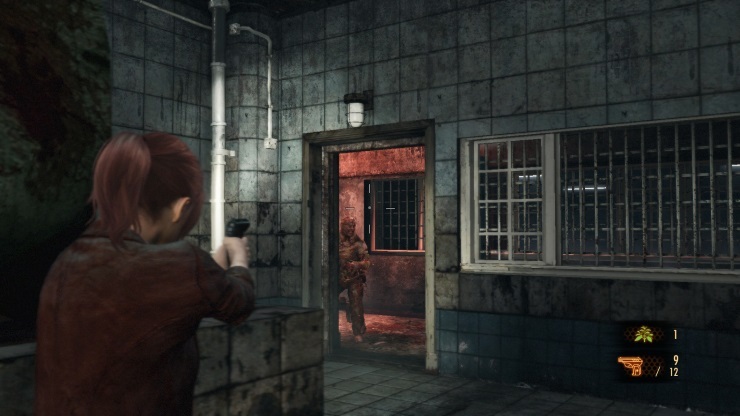 Revelations 2 is at its best when switching at pace, truly having the protagonists working in-sync. It isn’t going to win awards for its stealth combat, though. There was one section where three enemies were grouped together. I was able to take out all three of them without being spotted, despite the fact that after killing two of them, the third walked passed me unaware I was killing his undead mates. Elsewhere, all the modern Resi-tropes are present. Herbs are quickly usable, you can upgrade weapons (at a work bench, no less), and you’ll find hidden gems that count towards BP, which after each chapter allows you to unlock and upgrade skills. There’s a wide variety of them, too, and they genuinely help towards an overall feeling of progression that, in turn, makes the whole thing feel rather compelling. Episode one is split into two chapters, initially led by Claire and Moira, with Barry and Natalia taking the second chapter. What at first seems almost lazy, quickly reveals itself as a clever idea: chapter two sees Barry going through many of the same locations as Claire, though the devastation and changes made to the environment in her story change the locales for his. Claire has to turn on the power to escape her prison, which also turns on the traps. To progress, Barry must turn the power back off and find a different way. It’s clever, though not without fault. The enemies each pair face are completely different, and this isn’t explained. That said, the closing moments of episode one sees Capcom drop the mic, and suggest there’s more than meets the eye, and left me wondering if the difference in enemies is explained after all. Furthermore, the trick of recycling the environments might get old (though the second half of Barry’s chapter reveals a completely unexplored route) – it’s one of those tricks I don’t think they can use twice. Playing on PC, the visuals are decent, but close inspection of some textures leaves a little to be desired. For every moment that is genuinely gorgeous, you’ll get a rough-looking piece of rockery. It also has a few similarities with The Evil Within. Whether intentional or not, the horrific traps and setting itself do feel, dare I say it, a little bit Mikami – though far less oppressive. 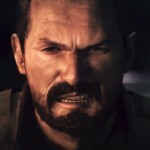 The audio is spot on, however, and it’s fantastic to play as Barry Burton, who sounds great. Also included in the package (aside some other pieces I won’t spoil) is Raid Mode. We’ll go into more detail as the episodes come out, but so far it’s more of that great gunplay. 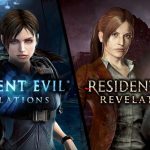 With the recent success of Resident Evil HD, and now Revelations 2 starting so well, it seems Capcom finally have Resi back on the right track. 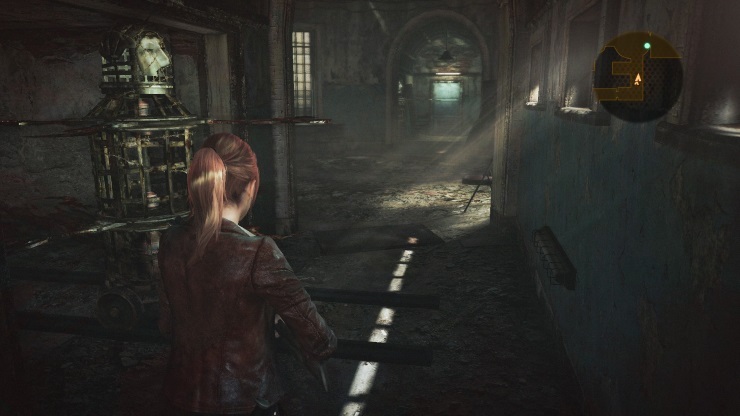 Despite a few concerns, Revelations 2: Episode One is a triumph. Exciting, daft, and containing a few genuine jump scares. 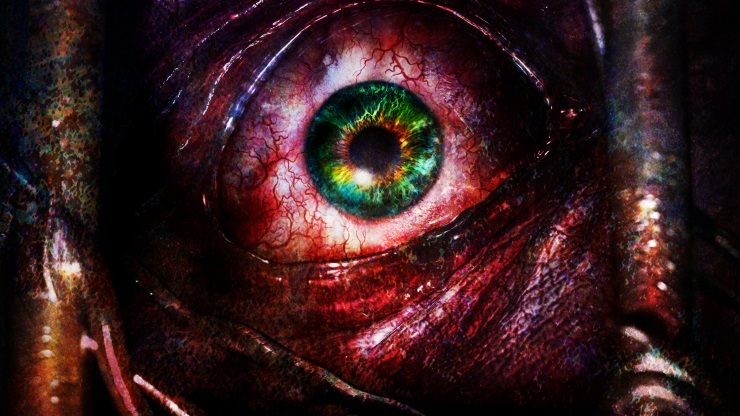 What more could you ask for from Resident Evil? See our interview with the producer. Subscribe to our YouTube Channel to never miss a video.